Comic-Con Guide: SDCC 2017: Did you have a good time? SDCC 2017: Did you have a good time? By now most of us are home from San Diego Comic-Con: doing our laundry, organizing our piles of comics and t-shirts and exclusives, and maybe contemplating what we should have done differently. 2017 was not the smoothest year by any yardstick - and while every summer brings a crop of attendees who swear off SDCC forever, this year seemed to move even more people across that line. Let's just get right to it. The Hall H line is always a tour through hell, but this year it reached new levels. The initial scandal was a dispersed line that was replaced by a later line. Unfair! We thought that would be the Hall H line scandal of 2017; little did we know that someone apparently made fake wristbands to let other people cut in ahead of the people who were legitimately wristbanded. My friend's friend saw someone let in a massive crowd of people ahead of him. Someone else reported seeing an actual bag of the fake wristbands - though I'm a bit dubious of this story. People believe it was an inside job, aided by a volunteer or staffer. What we do factually know: that roughly 400 people with wristbands were locked out of Hall H. They were given 4-day badges for 2018 in compensation, but this still caused an uproar. 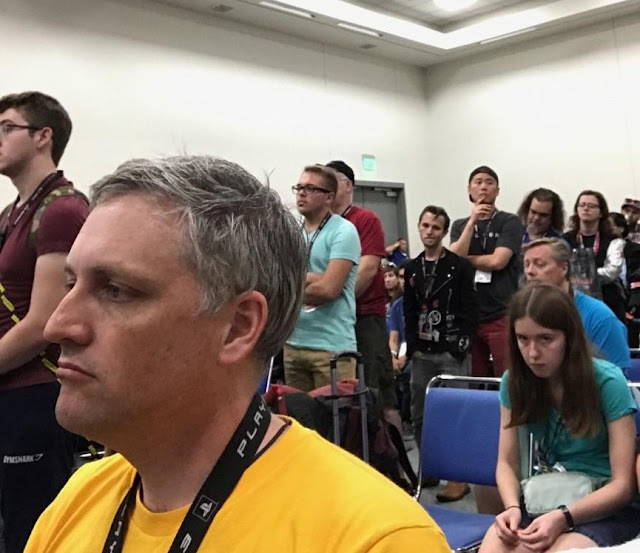 In the talkback session, attendees suggested RFID wristbands (see all those happy faces below); I kind of doubt this will happen but it's obvious something has to be done. I think CCI has stepped up its game in many ways over the last 5 years - the smoother badge sales, the Toucan blog - but the issue with lines is an area they need to tackle more adeptly. The wristbands aren't enough. I know no one wants a Hall H lottery but I do think that would be the fairest and most peaceful way of allocating access. In general, there is no easy answer that will make attendees happy. Often attendees have a rather childish attitude here; they know we have 30,000 people who feel entitled to entering a room that holds 6,000 but they expect CCI to develop a system that can painlessly cater to their individual needs. Hall H can't accommodate everyone, it's that simple, and as long as it's a battle of wits and tenacity, we'll see more crime and deception in the mix. Just my opinion; I always welcome hearing ideas for fair and efficient Hall H access. This year set a record in the number of people I know who never set foot in the Con. They were all about offsites and events. I kind of love these people because I'm the exact opposite and it keeps them out of my panels and lines - but I do question how long this population can increase. Attendees who come solely for that purpose must realize that offsite lines are becoming the new Hall H lines, with people lining up earlier and earlier. Eventually we'll have attendees battling the badge and hotel sales to spend a grand total of maybe 2 hours all weekend in actual offsite participation. 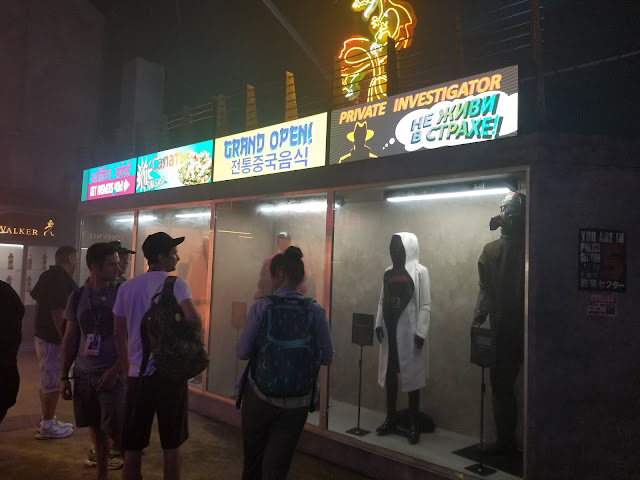 While the Game of Thrones experience delivered with its little videos, more people seemed impressed by Blade Runner (below). The Westworld experience also wowed, but ultimately left a sour taste in many attendee mouths, give how it was open to fewer than 500 people the entire Con. After sending out elaborate invitation emails, it felt like a tease. I thought the Netflix offsite was better than Blade Runner, though I'm not sure who agrees with me. I didn't do anything with the Tick and haven't heard much about it either - it might have been great, but it was overshadowed by Blade Runner and Netflix buzz. The Tech Pavilion was my favorite offsite, but ignored by most attendees. While the robotics weren't all that impressive, some of the other technology was worth checking out. Not only did it offer better VR than Blade Runner (and let attendees chill out on beanbags while watching 360 dome films of trippy Vedic mythology and Neil deGrasse Tyson cosmology lessons), it was easily navigable, involved no lines and actually offered something you can't get at home. The kind of offsite would have been the dream of SDCC attendees 15 years ago; alas, most of today's attendees would rather spend 6 hours in the sun hoping to see Barb from Stranger Things. As always, I chatted with other old-timers about the changes at the Con. Most seemed resigned and adaptive, but two told me they decided this was their last Con. (A thought I entertained at length on Preview Night.) Several pros I know couldn't afford to come; the Archie booth was gone; the big Bud Plant booth, one of my top 3 favorites, shrank to the tiniest size possible. I bought armfuls of books from Fantagraphics and Prism and a few other comics/books and that was about it. I thought both Preview Night and Sunday were more crowded than last year, while Saturday was more manageable. The entry processes weren't great, with some confusion on what kind of lines people should stand in and how they should be let in. I feel this should have been more smoothly organized. This isn't exactly a change, but the demographic this year felt less geeky than ever. Another veteran attendee and I agreed to stop referring to attendees as nerds, because the vast majority are celebrity hounds and mainstream fans. I don't mean that to sound elitist (as I'm sure it does) but maybe 1 out of 12 people I meet at SDCC can talk comics, science, anime or gaming. That sense of nerd community has become faint. I realize we live in an era where people think watching "Rick and Morty" makes them a nerd but I'm not willing to evolve on that language point yet. In terms of what didn't change: Several people made a now-recurring complaint that the same panels are offered year after year. I think CCI is trying to stay current by bringing us panels on AI and diversity and LGBTQ rights, and people like Roxane Gay, but I also think there's a reason we see so many "How to Break Into Comics" and "Women in Comics" panels - people go to them. Otherwise, while there were a few switcheroos here and there, it mostly felt like business as usual. I don't view the Hall H debacle as a change but the next logical development in an ongoing dysfunction. Most of the staff were just fine - but I did encounter some aggressive security and volunteers. Some seemed legit ready to snap. One actually barked in my face when he blocked my path to a women's room and yelled at me to use the restroom behind me, which was a men's room. Long day, I guess. A first-timer couple I know were shaken by a bad experience with a staffer, who they felt overreacted to them asking why they couldn't enter a certain area. In general, people just seemed exasperated and defensive this year. However, what bothered me more was the change in some - not most, but enough - attendees. Is it me or is there a new ruthlessness in our ranks? It's not just the Hall H fake wristband issue. And yes, I know we've always had those cutthroat attendees who would sell their grandmother to get into a Marvel panel. But there seemed to be more people willing to use more underhanded tactics to get what they wanted. It was very disheartening. I posted a few months ago about an increase in people who contact me to demand extra tickets, badges and hotel rooms without so much as a "Hello" - I don't know what laboratory this strain of attendee is being bred in but they need to be discontinued. I also ran into more people who seemed unable to handle the crowds, lines and general inconvenience of Comic-Con. Were they first-timers? I don't know. On Sunday, one guy was literally pushing my back in the Exhibit Hall and almost toppled me onto a stroller with a baby in it. I turned and told him I couldn't go anywhere and to stop shoving me. He griped about how slow-moving the crowd was. You think? Welcome to Comic-Con. Another guy snapped at a little girl so harshly her father stepped in. Usually everyone is polite and understanding about the claustrophobic swarm that is the Exhibit Hall, so I'm hoping I just saw the few exceptions. I thought the cosplay was average. My favorites were a Sid and Nancy couple, a refreshing change from the 437 Wonder Women strolling around. Most of what I saw was fairly traditional. 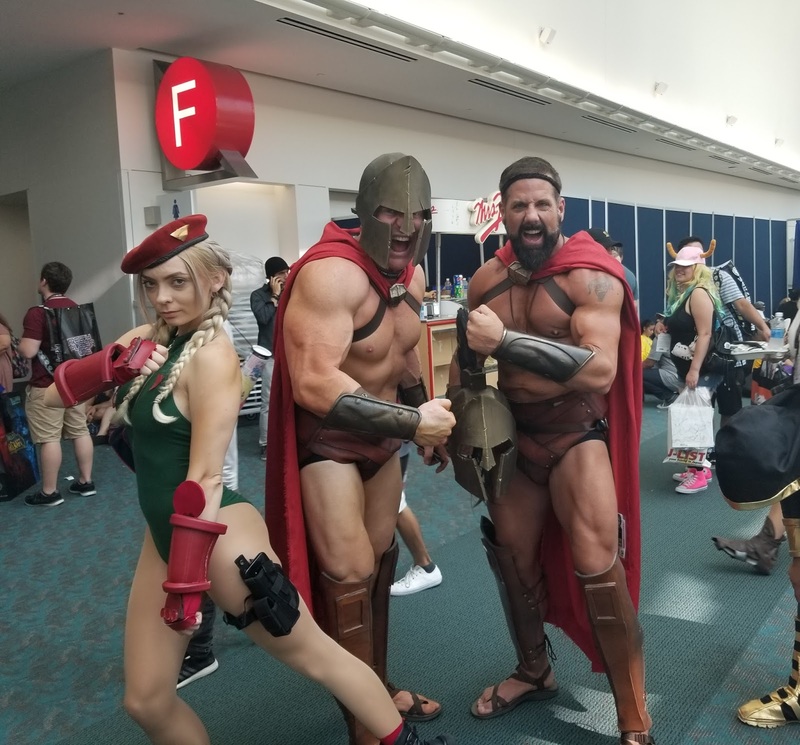 Of course there's always world-class cosplay at SDCC, but I feel like Dragon Con and Emerald City are becoming the destinations for the really innovative cosplayers. Two people said to me they thought this year was "weak" in terms of bombshell announcements. Was it shocking to find out that Wonder Woman 2 was happening? That American Horror Story's new season would be called "Cult?" Not really. I don't think DC announcing a "Shazam" movie rocked anyone's world either. The most controversial announcement was "Confederate," the new series helmed by the GOT team that will focus on what would have happened if the South won the Civil War. Ben Affleck hinting that he may be leaving his Bruce Wayne days behind wasn't exactly lamented. And we found out Doctor Who actually can be called Doctor Who and not just The Doctor, which settled a long-standing debate. I thought some of the comic book announcements were good, especially the resurrection of old favorites like Sandman, Arkham Asylum and The Invisibles. Harley and Ivy Meet Betty and Veronica will be a surefire hit. Especially intriguing: Andrew Aydin (of John Lewis's "March") may be writing more graphic novels about the civil rights movement, and one could just possibly concern Maxine Waters. DC admitting its sales troubles was interesting. They announced a new strategy of evergreen stories that sit apart from the monthly titles; we'll see if they help. The Gerard Way Young Animal crossover with mainstream DC could be invigorating - and I'm fairly optimistic about DC's new The Terrifics (cough, not at all like The Fantastic Four, I'm sure) who will be part of their Dark Matter imprint. I'm still collecting reports from first-timers, which I'll publish in a few days. I might also do a post on their questions, as I heard from many people who were stunned at the lines and chaos (despite being warned.) And news will continue to flow out all week: who got the best buzz, who failed, deals that were made and problems that arose. Be more proactive about shaping your Con destiny, instead of waiting for it to be delivered. I don't just mean getting in line early enough or doing the right research. Think about what you really want out of Con (more parties, more career advice, more art and media discoveries, etc) and dedicate yourself to making it happen. Often that means sacrificing other parts of the Con. Identify what bothered you and find a new Con where it's not as much of an issue. If you want more of a focus on comics, go to Emerald City with me next March. SDCC may be the most hyped Con but it's not the only game in town by any means. Also consider other types of conventions. I know former attendees who now spend their time at cons for anime, books, death, science and specific fandoms and they're much happier. Think about stepping away from Con life in general. SDCC is right smack in the middle of summer. It can be hard to plan other vacations or summer travel with so much time and resources flowing to Comic-Con. Maybe it's time to put it to the side and go see the world. But I know most of you are committed to next year. You're already hunting down hotel rooms, deciding which of your friends to initiate, and planning your Returning Registration strategy. The next badge sale might be months away but SDCC life is never really over - because most of us don't want it to be. A few friends of mine decided to go and look at the stuff happening outside the convention centre. For them, the crowds were a lot. And the heat and humidity weighed them down. They didn't get passes this year and thought there would be more to do outside than inside. Overall, they had a so so time. They felt it wasn't worth their time and effort, but may go next year. But they felt it'll be the same as always. For them, CC has become predictable with little in terms of surprises or things to look forward to. I was a little disappointed since I've always enjoyed my time there when I was able to get a coveted pass. But CC might have become too big. I think it's still worth going if you temper your expectations. It used to feel like Aladdin's cave of treasures; that aspect has died for me and other old-timers. But if you go in with realistic expectations, it can still be a good time. That said, I would not bother going to the area without a badge. Being an SDCC spectator isn't much fun these days. We had a good time, although the heat was too much for my wife. We didn't get to do everything we wanted to do. But even the people watching is wonderful. Next year we may go to wonder con instead. I plan to do that go to WonderCon. I've gone a few times in the past and had a great time. It's not as crowded and to me seems more what San Diego CC used to be. That sounds like a very wise plan. - I really, really missed Nerd HQ Conversations for a Cause. It was wonderful to have one guaranteed popular panel a day for the last few years. That said, we spent more time in smaller panels and in the Exhibit Hall than in years past, and had a great time. I was thrilled to meet some of my favorite authors - Leigh Bardugo, Marie Lu, and the up and coming Tomi Adeyemi - in a casual setting, and I scored some signed ARC's. - You really need to go to the Her Universe Fashion Show. It's a tradition for us now. The designers are so creative, and the swag is fun, too! - Biggest Disappointment: Would have loved to do Westworld Experience, but lining up at 1 am wasn't happening. We didn't even bother, thanks to Twitter updates. They need to do online reservations, and so does Hall H.
- Most Pleasant Surprise: The US Grant, though a little out of the action (10 min walk), was WONDERFUL. The room and food were fabulous, and the service was absolutely impeccable. I would stay there again. We truly felt like we were on vacation! - Most Random Bit of SDDC Luck/So Jealous! : Our friends, who are 2nd timers from ATL, were having a horrible day (couldn't get into anything they wanted) and were wandering the Gaslamp Fri night on the way back to Hotel Z. 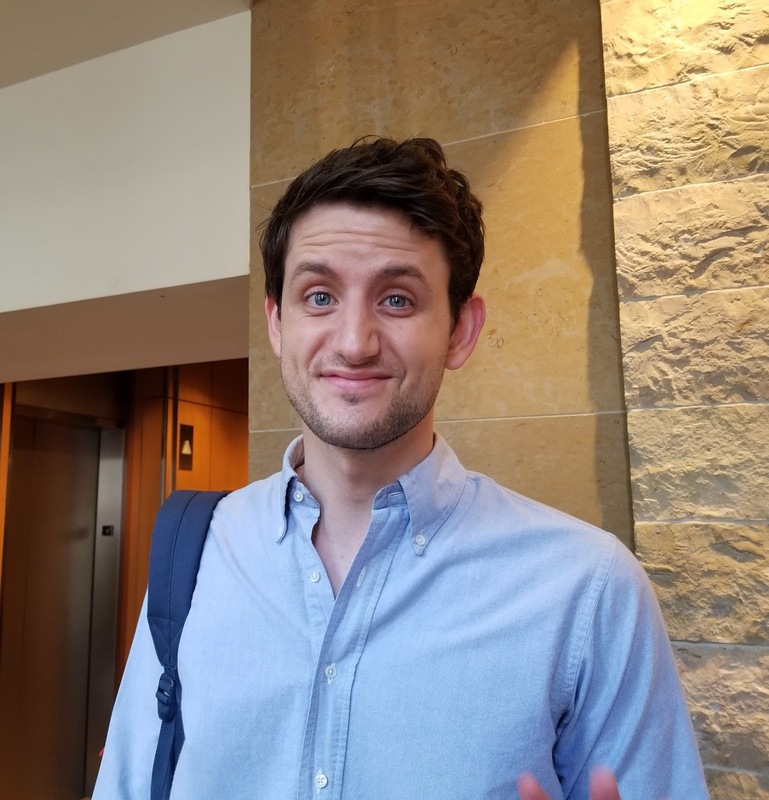 They first ran into Thandie Newton (Westworld) on the street and got a selfie, then managed to talk their way into the Black Panther cast party (which she had just left) and got pics of Chadwick Boseman and selfies with Iwan Rheon (Ramsay Bolton on GOT and the Inhumans), who they said was a genuinely friendly guy! LOL. They'll be back next year, and so will we, hopefully! I can't believe it's already your 4th year! Tempus fugit. You're not the only person to miss Conversations for a Cause. 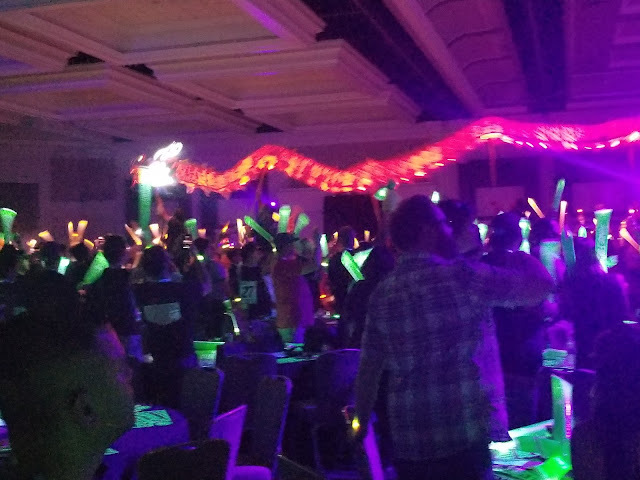 They really added something to the Con - a very different experience from SDCC panels. But I'm glad you met some authors and tried some of the smaller panels. I've never stayed at the US Grant - good to know that it's a nice place. As for your friends, anyone who can talk their way into a cast party (let alone Black Panther!) has some kind of gift. Attendees go to Comic-Con for years without that kind of luck! OK, guy here whose never been. All these reports of lines and trouble. Should I bother even going when it's this tough? I've wantedd to go at least once but every year it's sold out and now I think maybe I should forget it. Curious for your take. Yes, you should try to go. Sign up for a Member ID now at comic-con.org now and you'll get an email when the next open badge sale is held. If you want to increase your chances, read the blogs and forums and link up with other people who can help you. SDCC may not be for you, but you should at least go once and experience it if you can. If I go, I'll only be there Friday.